All things being equal, everyone develops a first language, observes Richard R. Day, chair of University of Hawaiʻi at Mānoa’s Department of Second Language Studies. "You do it through fun and play and you receive a lot of support," adds Associate Professor Lourdes Ortega. Parents and teachers help children learn, and there is continuity since the language is used all around them. It’s the second language that can be daunting. "You go from being very capable with your first language to having to cope with not being very capable in the new language," Ortega says. Success requires motivation and persistence and a great deal of effort. Understanding and improving the process is what second language studies is all about. Mānoa’s Department of Second Language Studies (formerly English as a Second Language) is the first and largest such department at an American university. It is internationally recognized for the depth of its curriculum and the diverse expertise, professional activity and research productivity of its faculty. Competition to enter the graduate program is high, with 80-90 applicants to fill 5 PhD slots each year. "Everyone in second language studies looks at what’s coming out of UH," says master’s student Leon Potter. "We have the top of every field." The common misconception is that you are just learning to teach English, he adds. SLS looks at how second languages are learned, how they could be taught more effectively and what psychological and sociological factors influence their acquisition. That knowledge has a significant impact on proficiency assessment, program organization, teaching methodologies and legal and social policy issues concerning language. Gone are the days of teaching solely from textbooks. "Instead of learning grammar, you learn by doing," says Day. Instead of trying to teach an entire language, task-based language teaching focuses on the language needed to do certain tasks. A needs analysis determines what students want to do with the language, representative tasks are chosen and pedagogical methods developed accordingly. If nurses need to learn Spanish, programs could be developed to teach them to converse with patients and doctors and read charts and prescriptions. "It is not just grammar," Ortega says. "For example, international students need to go to the library and borrow materials. You need to consider what terminology is needed to converse with a librarian or to go online to find the desired text. There is language you need to know for the specific tasks that may not be in a language textbook." A popular test is ordering pizza. Students have to understand how to call, where to look up the phone number, what the topping options are and how to order. They phone in their order to an instructor. By doing the task and using the language, they begin learning the language, says Ortega. "Doing drives the learning." Mānoa’s SLS department hosted the Second International Conference on Task-Based Language Teaching in September. The two-year project coordinated by Professor John Norris culminated in 100 presentations and drew 250 participants from 22 countries. Day and Japanese Instructor Claire Hitosugi introduced another component into language learning—extensive reading. The practice had been around for a while but not used in Asian language programs. 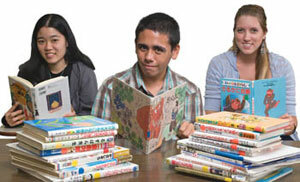 Students in a second-level Japanese course were instructed to select and read large quantities of books. The more they read, the greater the benefit. Students weren’t tested on the books, but were encouraged to write book reviews. The instructors didn’t worry about strict grammatical translation. "It was okay for the students not to understand every word. The goal was for a general understanding of the meaning of the book," says Hitosugi, who earned her master’s in English as a second language at Mānoa. In the absence of graded readers or literary materials for students learning Japanese as a foreign language, they used children’s books. Hitosugi scoured book sales, got donations and even bought in her children’s books to build up the library. "The started off with simple picture books and moved on from there," she says. "This was the first time these students ever read an authentic book written for a Japanese audience." A bonus was exposure to Japanese culture through the stories. Students were a little confused at first, admits Day. "Intellectually they were in college but they were reading Japanese at a preschool level." But the experience gave one student a chance to bond with her grandmother, Hitosugi says. "The grandmother spoke only Japanese, and they weren’t very close. When her grandmother recognized the books she was reading they started to read them together." In another instance of learning by doing, Day took 10 master’s candidates to Ubon Rajathanee University in rural Thailand last summer to teach English to first-year college students. They conducted eight weeks of intensive instruction in writing, reading and speaking/listening. "This was a practicum course; we were all there to get teaching experience," Potter says. The Thai students had learned some English but few had exposure to foreigners. Only one of Day’s students spoke Thai. After a difficult first few days, the students quickly improved. Some lessons plans had to be altered, Potter says. "I was planning to teach my students about paragraphs during the first class. I had to go back and focus on sentences." Potter’s free-writing sessions were a success. He had students write for 10 minutes on an assigned topic without worrying about accuracy. To get the point across, he took away their erasers. It was hard for the students to let go of the need to be grammatically correct, but when he showed them their papers, they became excited about how much more they were writing, he recalls. "The first time they did the assignment, they produced 27 words on average. By the end they produced 80 words." The Mānoa students made an impact. Potter says a teacher who had their students at the next level was amazed. "She never heard the Thai students speaking English outside of class, but our student were telling jokes in English." How can that not be success? After serving in the Peace Corps in the Philippines and teaching in Japan, Frank Noji returned to Hawaiʻi and taught in the University of Hawaiʻi Laboratory School. He earned his master’s in English as a second language and a professional diploma from Mānoa and helped set up an English program at Kanazawa Institute of Technology in Japan. He later joined Kapiʻolani Community College, where he began overhauling the campus’ English for Speakers of Other Languages Program. Since 1997 Noji has employed a content-based approach to develop English language skills. International and immigrant students enroll in the program to develop their proficiency in English to be able to take college-level courses. There are approximately 400 students in ESOL every semester. Classes revolve around a theme, such as food, the environment, health and family. Each theme consists of readings, seminars, pod casts, films and a poster session. "For example, during the semester with the food theme students read about food from various aspects—history, sociology, business, health, etc. They watched My Big Fat Greek Wedding and other movies where food is relevant," explains Noji. Students then created a poster session on a topic and invited other ESOL classes to view and discuss their posters with them. Studying only from textbooks doesn’t work, Noji says. "Grammar in isolation doesn’t support language use." A number of campuses offer English language instruction for foreign and immigrant students.